When I worked at a theatre company in my teens, one season there was a play that opened with Geroge Gershwin's “Rhapsody in Blue”. I fell for it at first listen, somewhere in between the flirting tumble of notes at the beginning and the arcing rise up the scale before the clarinet cascades in a sigh. It was summer, and the play was a love story. A friend of mine had a breathless crush on the production's male lead. One afternoon, the power went out in the theatre, so the show continued by candlelight. It was all pretty romantic. I'm keenly aware of how strange it sounds but when I was trying describe these apple cider caramels, namely caramels spiced with chai masala, strains of "Rhapsody in Blue" kept coming to mind. Before I lose you entirely, it might be best to try to lay out what we have here. The recipe starts with reduced apple cider, bulked up with sugars and swirled with butter and cream. Then things perk up with a combination of spices; cinnamon, cardamom, clove, and ginger, flinty with black pepper, which taste to me how that Gershwin tune sounds. 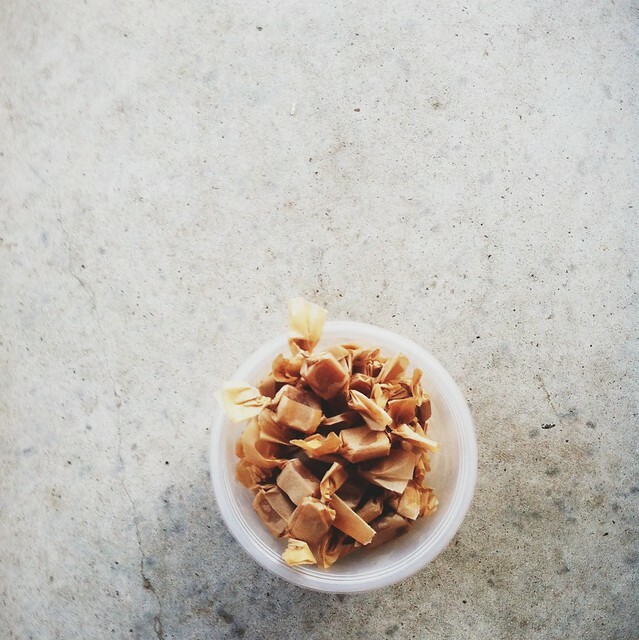 Caramel can oftentimes be flat, all sugary heaviness, a dud. These caramels lilt; they flicker and spark. There are highs and lows, deep sweetness, prickling warmth, fragrance and flavour that rolls and develops. They're romance and drama wrapped up in brown paper, and totally worthy of infatuation. They are soft caramels, not the kind that stick to your teeth and threaten to pull out your molars, but yieldingly-so; they stretch only the tiniest bit when bitten, then relax, supple and dense as you chew. We made them by the trayful for gifts this December, in both a straightforward cinnamon version and this fussed up one. They were so popular, I'll be making them into January as well. I am not one for candy, usually, but found it easy enough to make an exception in this case (this being my other). And speaking of ease, these are a cinch as far as candy making goes; some boiling and stirring, then pouring out. Just make sure to keep an eye on the bubbling pot towards the end — when it comes to temperature the caramel will be a smidge lighter in colour than these photographs show, as the shade deepens with the addition of the spices, and even further when the candy cools. And for that ease, you get something stunning. 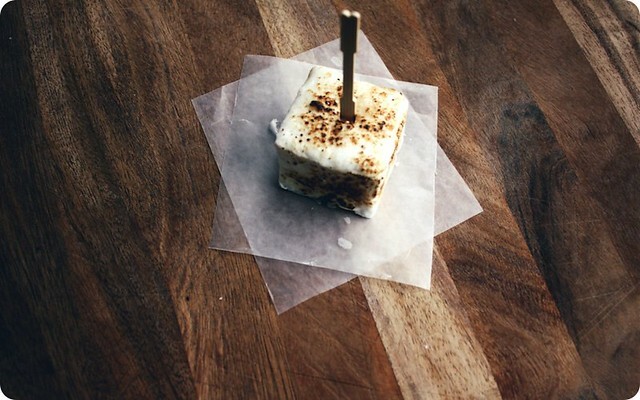 A candy that's interesting yet familiar, and altogether dreamy. Candlelight not required. Modified slightly from Deb Perelman and her book The Smitten Kitchen Cookbook (Appetite by Random House, 2012), rewritten by me, except as noted. Cinnamon, cardamom, ginger, clove and black pepper are fairly standard for chai masala — the mixture used, as you might gather, to flavour masala chai. I think the assortment of spices brings further complexity to the caramels, and works nicely with the apple cider. And, as it's evocative of gingersnaps and gingerbread, the blend matches well with the echoes of the holiday season. While it's not traditional in masala chai, if so inclined, seeds scraped from 1/2 a fresh vanilla bean can be added to the spiced salt. The original caramel recipe calls for cinnamon alone, so feel free to use 1/2 teaspoon of the ground stuff if that is your preference. Deb says: Apple cider (sometimes called sweet or “soft” cider), as I’m referring to it here, is different from both apple juice and the hard, or alcoholic, fermented apple cider. It’s a fresh, unfiltered (it has sediment), raw apple juice — the juice literally pressed from fresh apples. It’s unpasteurized, and must be refrigerated, because it’s perishable. In the Northeast, I usually find it at farm stands and some grocery stores. I occasionally find vacuum- sealed bottles called apple cider in the juice aisle, but none of the bottled varieties that I’ve tried has the same delicate apple flavor as the more perishable stuff sold in the refrigerator section. Bring the apple cider to a boil in a large saucepan over high heat. Continue to boil, stirring occasionally, until transforms into a dark, thick syrup and is reduced to about 1/2-1/3 cup in volume, which should take around 35 to 40 minutes. Meanwhile, set out the other ingredients, as the candy comes together pretty quickly at the end. Line the bottom and sides of an 8-inch, straight-sided metal baking pan with a cross of parchment. Set aside. In a small bowl, stir together all the spices with the sea salt. Once the apple cider is reduced, remove it from the heat and quickly stir in the butter, sugars and heavy cream. Return the pot to medium-high heat and let it boil until a candy thermometer reads 252°F, about 5 minutes. 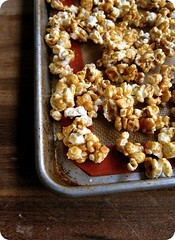 Immediately remove the caramel from the heat. Add the spiced salt mixture, and give the caramel several stirs. Pour the caramel into the prepared pan and set it aside to cool; around 2 hours at room temperature, or faster in the fridge. Once the caramel is set, use the parchment paper sling to transfer the block of candy to a cutting board. 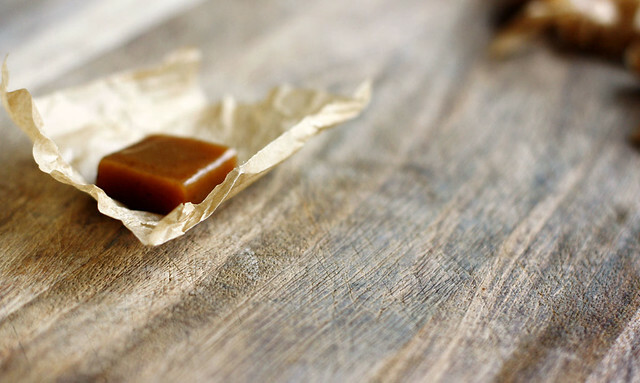 With a well-oiled knife, cut the caramel into 1-by-1-inch squares. Place the cut pieces onto a parchment-lined baking sheet and place in the fridge for 10 minutes before wrapping. Once firmed up, wrap each in pieces of parchment or wax paper, twisting or folding closed. 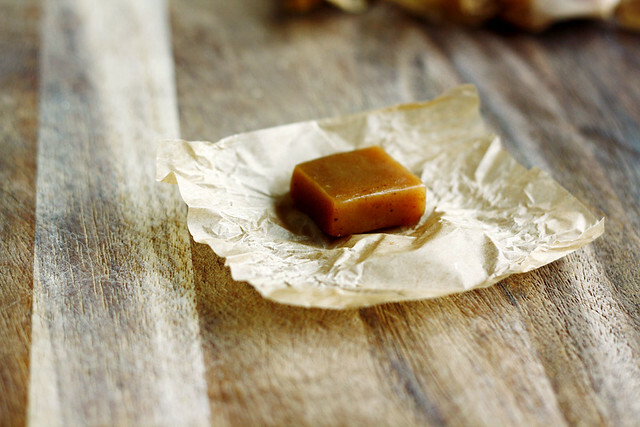 The caramels will be soft at room temperature, or can be kept firm in the fridge. They'll last about two weeks, either way. First photo taken from my Instagram. For those who asked about the recipe, this is for you. I hope you enjoy them. xo! There was a lady I used to know who always kept candies in a bowl on her coffee table. My oldest nephew, who’s now 12 years old and almost as tall as I am, sometimes visited her with me - he was maybe three at the time? He’d toddle over to her knee, ask politely for a candy, and then, manners dispatched, gleefully help himself. I think he thought her lovely, and possibly magic, as he should have - because she was a lovely person, and really an ever-full candy dish does seem a little magic, doesn’t it? 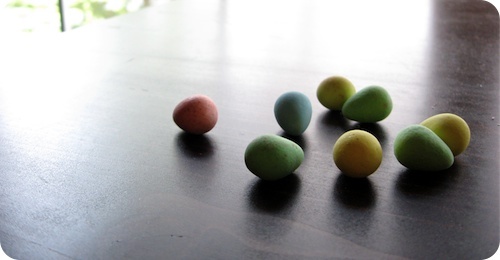 The candies on offer would change with the season; Hershey’s Kisses on Valentine’s Day, chocolate eggs at Easter, hard butterscotch rounds come Thanksgiving. In winter, the candies were often flavoured with mint. 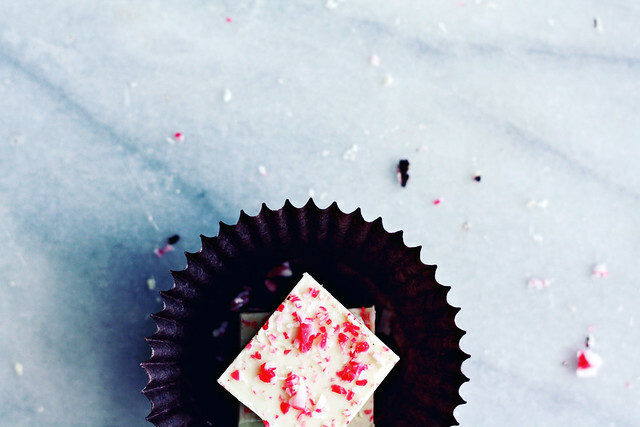 There would be swirled peppermints, soft-centred mints enrobed in chocolate, and hard mints with truffled fillings. Of all the minted variations, my favourite were these chocolates flavoured with peppermint through and through. They were blocky things, made at a local shop that’s now gone, and they came wrapped in foils the colour of jewels left out in the frost. They were mild - the chocolate wasn’t too bitter, the mint wasn't too sharp. They were gentle and beguiling, with a right hit of pep, much like our host. I adored those chocolates. I adored them enough that the other night, after hours of driving in rain and gloom, I sought out some peppermint chocolates in the dusty corner of a dodgy shop and, with full knowledge they were not the right kind and were probably going to be comparatively horrid and would never be considered coffee-table-eligible, I bought them anyway. Then promptly ate three, ignoring their inferiority and happy for their existence because they unexpectedly reminded of her, and that was nice. I even brought a modest stash of those terrible chocolates home and ashamedly nibbled my way through the supply in the days since. So maybe it’s time to break out a double-boiler and do things up right. While Layered Peppermint Crunch Bark isn’t exactly the candy from memory, it is a darn swell substitute and far better than my sorry replacement of recent history. This triple-layer affair has texture and a retro appeal which those clunky, cubist darlings didn't, but it is similarly ideal for ice-capped days. They are a cinch to make, a melt-and-spread routine of white and dark chocolates, alternated with crushed peppermint snowfalls worthy of Willy Wonka himself. If you have a few hours planned around the house (the chilling takes some time), knocking together a batch of bars isn't too much by way of supplementary effort. If there's a group of you together, bulk batches are easily accommodated, and boom! Instant candy factory. It is an old-ish recipe I’m handing over. One, in fact, published only a year before that nephew of mine was born. This recipe is one that's been already introduced and is deservedly well-loved, but I’ll stop short of apology for the encore - familiarity and a hint of kitch needn’t diminish enthusiasm. Therein lies the magic of traditions I think; they bear repeating. We talk about them over and over again, fall into their movements year after year, like the well-worn memory of an old friend who always kept her candy dish topped up. For the dark chocolate, I aim for the middle of the road and use mostly semisweet and some bittersweet if I have both on hand. The combination seems to be the most universally appealing, which is an asset if you're making these for gifts or a party. Use whichever suits your fancy or your audience. Since semisweet chocolate is quite a bit softer than bittersweet, in that case I cut the cream down to 4 1/2-5 tablespoons. 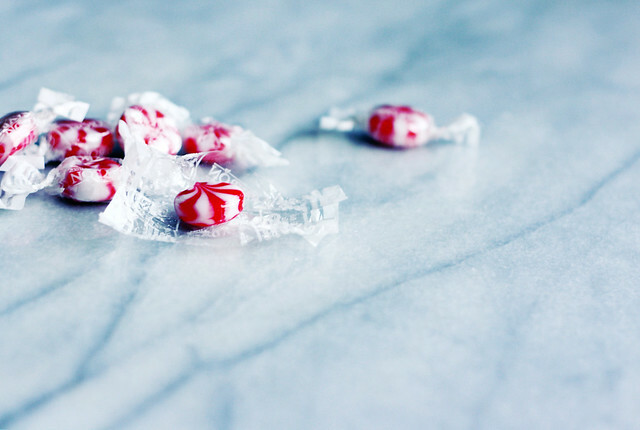 I have discovered that the red swirly peppermints called for are named "Starlight Mints" - could that be more charming? Pounding the pretties to an uneven dust affords the texture we like best. The tiny shards snap and the larger chunks crunch, but no piece is so large as to give any real resistance. 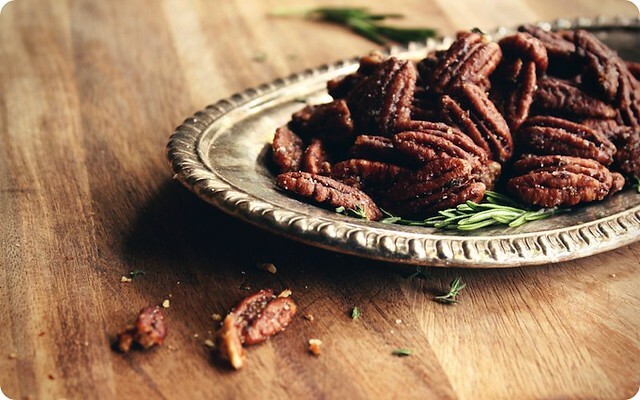 Run the peppermints through a coarse sieve. Reserve the dust to one side, and keep the larger pieces in the sieve itself. Turn a large, sturdy baking sheet face side down. Cover securely with foil. Mark a 12x9-inch rectangle on the foil. Place the chopped white chocolate and kosher salt in a metal bowl over a saucepan of barely simmering water, never allowing the bottom of the bowl to touch the water. 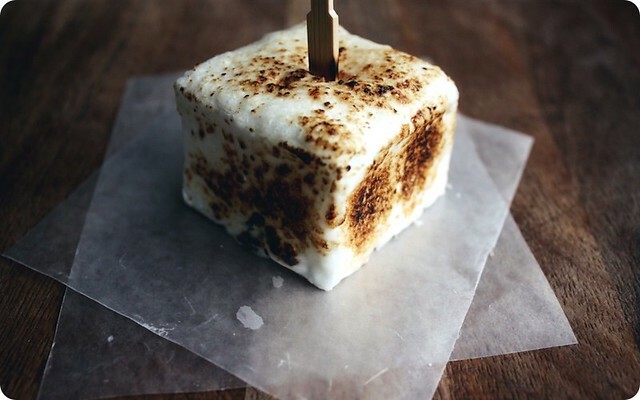 Stir until chocolate is melted and smooth, and registers 110°F on a candy thermometer. Remove the bowl from the water. Pour 2/3 cup of the melted white chocolate within border of the marked rectangle on foil. Using an offset spatula, spread chocolate to fill the rectangle. Mix some of the larger peppermint pieces into the dust to make up 1/3 cup. Sprinkle this over the white chocolate and chill until firm, about 15 minutes. Stir the dark chocolate, cream and peppermint extract in a heavy-bottomed saucepan over medium-low heat until smooth. Cool to barely lukewarm, around 5 minutes. Pour the bittersweet chocolate mixture over the white chocolate rectangle. Using a clean offset spatula, spread the bittersweet chocolate to form an even layer. Chill until very cold and firm, around 25 minutes. Rewarm the remaining white chocolate in bowl set over barely simmering water, again to 110°F. Working quickly, pour the white chocolate over the firm bittersweet chocolate layer, spreading with a clean offset spatula to cover. Immediately sprinkle with remaining crushed peppermints. Refrigerate until just firm, about 20 minutes. Lift bark off the foil onto a large work surface, with a metal spatula as aid if needed. With a thin bladed knife, trim edges. Cut bark crosswise into 2-inch-wide lengths. Cut each strip crosswise into 3 sections and each section across into squares. Can be kept, in an airtight container in the refrigerator, for up to 2 weeks. Seperate layers with wax paper to keep candies from sticking. 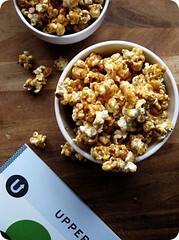 Serve straight from the fridge or allow to sit at room temperature for 10 minutes or so if a softer candy is preferred. For the record, if you stash some in the freezer and then bash it to smaller shards, it makes a fine topping to a scoop of vanilla ice cream.